A murderer on the loose…How will they catch the culprit and live to find love? Frederic, The young Marquess of Evermont is just the sort of Lord the rest of the London Peerage scorn. He and his rakish friend The Duke of Pemberton have made a reputation for drinking and gambling away their nights. Disregarding any sandal they leave in their wake. That is until Frederic meets the beautiful Miss Adele Bouchard. Adele is an actress who loves the stage more than any man. She knows that the Peerage consider an actress a woman of loose morals and she refuses to be what they say. 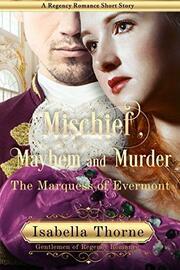 Adele has no love of nobility herself, but she finds herself wanting to trust the earnest young Marquess. But Frederic’s mistakes catch up with him, and another actress is found dead. Now no one is safe, especially the beautiful Miss Bouchard. Frederic swears he loves her and Adele vows to live long enough to see if the gentleman means what he says…even if she has to catch a murderer herself!